Available on new Volvo wheel loaders ranging from L110H to L250H — Volvo Load Assist provides both real-time intelligence to the operator and documentation of work orders for the owner and their customers. Managed through Volvo Co-Pilot, the award-winning in-cab interface, Load Assist eliminates the guesswork associated with loading accurate tonnage, reducing occurrences of reweighing and reloading, as well as providing opportunity for the owner to expedite paperwork and improve operator training. Through the 10-inch, high-resolution touchscreen Co-Pilot interface, the operator is able to set up projects in just a few touches by selecting customer name, work order number, target tonnage and material type. These settings can be stored for future work orders, and the number of customer presets is virtually limitless. Once the work order parameters are set, the Co-Pilot screen allows the operator to track progress of the job as it’s underway — displaying tonnage currently in the bucket, tonnage already delivered to the truck (or other delivery location) and tonnage left to be delivered in order to complete the job. The tonnage measurements are proven to be accurate to within plus or minus 2 percent, ensuring the operator can confidently send the truck back to the scale knowing it won’t be under- or overloaded. The display also allows for setting allowable limits on both the tonnage in the truck and the weight in the bucket. If the current weight in the bucket is overloaded, or if that weight will overload the truck — the operator is alerted. In addition to real-time payload information, the Co-Pilot interface displays bucket angle and machine angle in real-time, helping the operator more efficiently and safely load and dump materials. The Co-Pilot display also automatically engages the rear-view camera when the loader is put in reverse – allowing for better visibility on a larger display than ever before. The data logged through Load Assist can be captured in several ways — it can be uploaded to the cloud to be accessed via an online portal, loaded to a flash drive or printed on a small printer connected to the Co-Pilot interface via USB. The logged information includes work order number, customer name, truck loaded, load tonnage, and time and date of delivery — all in the form of a spreadsheet that is easily integrated into any customer ERP system. 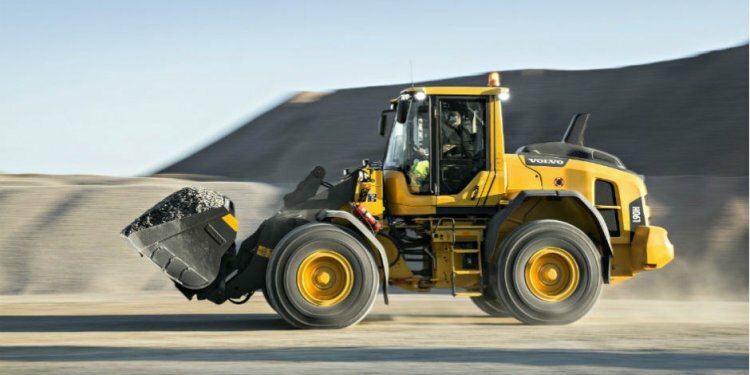 Because Co-Pilot and Load Assist are integrated into the wheel loader’s electrical architecture, the system also feeds productivity data to CareTrack®, Volvo’s telematics system. This data includes tons per gallon of fuel, gallons of fuel per ton, total number of cycles and percentage of cycles that were overloaded. This intelligence allows the owner to identify potential training opportunities for operators, as well as easily compare operating costs to production by machine and by operator — all reporting that wouldn’t be possible with a third-party aftermarket system. Built upon an Android operating system — Volvo Co-Pilot is designed in a way that makes it easily scalable as future software updates, additional functionality and new applications are developed. The system is 3G-compatible when equipped with a SIM Card, allowing for the system to automatically and wirelessly receive software updates without any required action from the owner or operator. In addition to Load Assist, Co-Pilot also serves as the interface for Compact Assist — Volvo’s Intelligent Compaction system with Density Direct, the industry’s first and only real-time density mapping tool launched for select Volvo asphalt compactors in March of 2015. Load Assist and Compact Assist are just the first two systems that fall under the Co-Pilot umbrella of intelligent machine services. Additional Assist programs will follow in 2017. The development of Volvo Co-Pilot was a result of collaboration between Volvo Construction Equipment engineers, product design and CPAC Systems AB, a wholly-owned subsidiary of the Volvo Group dedicated to developing technology control solutions. This collaboration proved successful, as demonstrated by Co-Pilot recently being honored as “Most Innovative Human-Machine Interface (HMI) Feature” with an award presented at the 2016 Car HMI — Europe’s leading HMI and UX event, which brings together more than 200 experts in HMI, usability and user experience. Beating out stiff competition, including the likes of Volkswagen AG, Volvo Co-Pilot was announced as the winner on June 20, 2016 in Berlin, Germany.